ABC Seamless Steel Siding project recently completed in Andover. This homeowner chose one of our brand new colors “Onyx” from our prism line. Also included was red blended shingle shake siding. One of several of our exciting accent products to give your home great curb appeal! 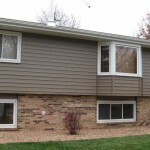 Contact us today for your next exterior project! ABC Seamless has been making over neighborhoods one house at a time since 1978. You can count on us for great experience from design to completion! See Your City?ABC Seamless / Twin Cities Exteriors serves the following north and west metro suburbs.